One of the things I find difficult at Christmas is finding a gift that is perfectly suited to the person I’m buying for. I’m never quite sure if they’re going to like it. There is one gift though that I’m never in doubt with and that’s Empire Theatre Gift Cards. They are probably one of the best gifts you can buy because you know that the person who receives it will end up seeing exactly what they want to. I know I would love to receive Empire Theatre Gift Cards because there’s at least six movies I can’t wait to see. *Hint Hint* for anyone currently looking for something to give me. 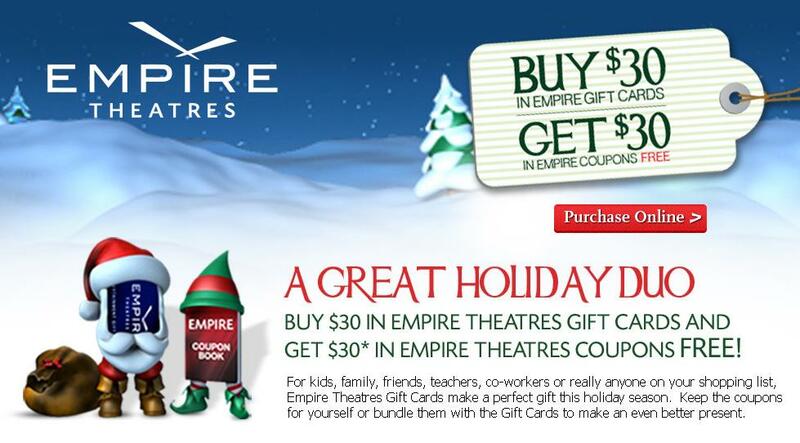 Right now if you buy $30 in Empire Gift Cards, you receive $30 in Empire Theatres Coupons that are good at certain times through the new year. Like Buy One, Get One admittance in January or see a movie in March for only $6.99. It’s really the gift that keeps on giving. OR you could tuck those little gems in your purse for yourself and just give the gift card. Just a suggestion for all those out there that deserve a little gift to themselves. I plan on giving one of these to my son in college. The kid is broke, with a girlfriend. What could be better? Right. I’m also going to tuck a couple in my girl’s stockings. It’s fun for them to take you out to the movie once in a while. I know, it’s a slight of hand, but fun all the same. Nieces and nephews are also getting these. Thankfully, nobody in my family reads my blog. You know what else I really like about giving Empire Gift Cards? I know I’m giving the gift of entertainment, something that everyone loves. Nothing will get thrown away, no fake thank yous, no sad faces and no crazy stores.